8 November 2016, at 12:00a.m. 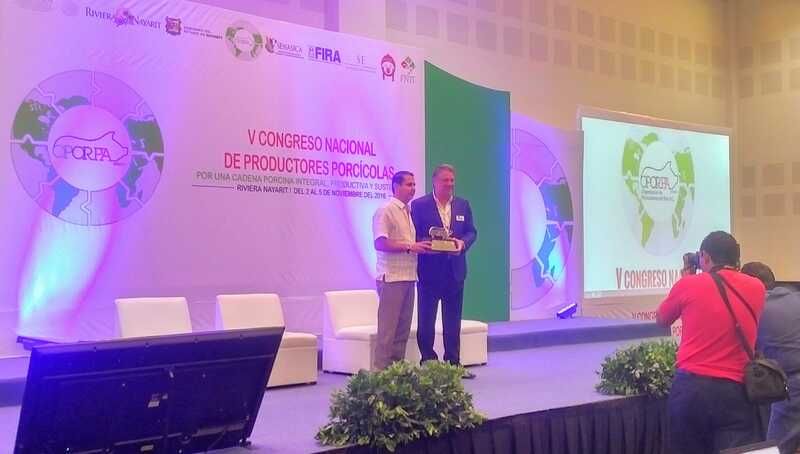 MEXICO - Last week, we attended the Mexican Pork Association – OPORPA Annual Meeting, held in Riviera Nayarit, writes Jim Long, President-CEO Genesus Inc.
• Approximately 800 swine industry people participated, mainly from the northwest and central regions of Mexico. • Many producers brought their families, as it was held at the beachfront Hard Rock Hotel. We have certainly been in worse places. 32 degrees Celsius and sunny, each and every day. First class facilities and hospitable staff. • The organization of the event by OPORPA was excellent. A varied cross section of speakers, with sessions and event areas that were well attended. We were one of the speakers. • Always good to go to Mexico, as we get to see many industry people we have met throughout the years. Our Pork Commentary has been on the Mexican Swine website “Porcicultura” for many years, and get extensive readership. It seemed many people knew the countries we have traveled in the last few months and how Genesus has grown in international markets. • Many commented on last week’s commentary about the press release regarding Porc-Ex, and how the largest global DanAvl (Danbred) dealer is now working with Genesus. They congratulated us and saw this as an excellent step for both Porc-Ex and Genesus. It was really nice to get such comments. • Currently, Mexico pork producers are in a much more enviable position financially than US and Canadian producers. While US-Canadian producers are losing in the neighborhood of $30 per head, Mexican producers are making $20 per head. • The current spread per head in US dollars is $85. This is the largest spread ever! Of course, we wondered how this was happening. Why wouldn’t Mexico, which is already the US’s largest volume purchaser of pork, not have massive imports and its hog prices collapse? • Then we realized Mexico doesn’t import market hogs, and that it imports pork. Despite the huge difference in market hog prices, we have to look at US pork cut-outs. Last week, US market hogs were 50 cents/lb while US pork cut-outs were 73 cents/lb. Mexico buys pork, not hogs. The 73 cents/lb pork cut out for wholesale pork is at a price in Mexico that is at their normal import spread. US pork is not cheaper than normal! • The difference is that while US packers have a huge gross margin of $50 per head, Mexico packers are at normal margins. Mexican producers and packers are both making money. • When we spoke in our session at the Congress, we pointed at the huge price spread between US and Mexico market hogs. We highlighted that Canada, as a net exported of pork, is driven by US markets and our farmers are currently losing money. Mexico, as an importer of pork, is currently benefitting from high US pork cut out prices. To us, it’s phenomenal that Mexico farmers are receiving $75 USD per head more than their US-Canadian counterparts when the free trade of pork exists between the countries. • There is some sow herd expansion ongoing in Mexico. Larger companies such as Carrolls (Smithfield), Kowi, Ramirez, and Norson (plus others) are adding more sows. Like the rest of the world, smaller producers go out of business and the big get bigger. • Up to now, Mexico has not had much pressure on animal welfare. Individual gestation pens are still being installed. • In hog equipment, Big Dutchman and Hog Slat seem to be the leaders in large projects, as they are in much of the world. • Mexico has been able to grow pork exports. One reason is that their pork prices (not hog prices) is relatively competitive with US packers. The second reason is that with relatively smaller packer plants, relatively low cost, and the available labour, Mexico can meet specific cuts and presentation required by premium buyers in Japan. This has been very beneficial for market share protection and growth. • One packer commented that they know US hams need to be imported to Mexico, because Mexico consumes more hams than they can produce. The Mexican packer suggested US packers should do a better job of holding price, and that US hams are sold cheaper to Mexico than they need to be. We have no idea if this is correct, we just thought it was an interesting perspective. Mexico is building some new sow farms. We don’t see much net expansion as other smaller ones go out of business. Domestic pork consumption could grow in Mexico. Mexico, like other countries, needs to move to better tasting pork (darker, proper marbling, and high PH). An observation, not a criticism. At the final banquet of the congress, we were all served pork loin. Unfortunately, it was white like chicken, had no marbling, and was overcooked. It was a product that was not delicious or flavorful. It would not stimulate you to eat pork again soon. As an industry, whether it be Mexico or any other country, we need to deliver pork that is tasty and flavorful. We need to get rid of marbleless Pietrans and Pietran crosses. They are a scourge on us growing pork demand. Demand drives prices, and more people eating pork more often should be our mission. What kind of pork do you like to eat? Are you producing it?